Reporters in Pakistan must deal with threats from both state and non-state actors. Approaching the third anniversary of the murder of Saleem Shahzad, a Pakistani journalist killed as he investigated the murky relationship between the ISI and Al-Qaeda, little progress has been made with the investigation. In many ways, Shahzad’s case signifies the challenge in Pakistan: brave journalists who face threats from non-state and state actors, and a system that is unable to provide them with the protection urgently required. 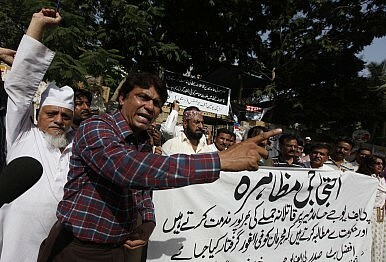 “Pakistani journalists are facing a conglomeration of threats and threats from so many different sides,” said Bob Dietz, coordinator of the Asia Program at the Committee to Protect Journalists (CPJ), a nonprofit organization that promotes press freedom and defends the rights of journalists throughout the world. While journalists around the world usually face threats from a specific source, such increasingly authoritarian governments in Turkey and Egypt, journalists in Pakistan must overcome threats from both state and non-state actors. One non-state threat facing Pakistani journalists throughout the country is militant organizations, including the Tehreek-i-Taliban. “The Taliban have made their intention very clear, they want to dictate terms to the media at the point of a gun,” said Khurram Husain, a business and economy journalist in Pakistan who writes a column in Dawn, one of Pakistan’s leading English language newspapers. Threats by militant organizations became an unfortunate reality for Raza Rumi, a columnist and TV anchor for Express News, when gunmen sprayed his car with bullets as he left work on the night of March 28 in Lahore. While Rumi survived and has since fled to the United States for his own safety, he said his coverage of Shia and Ahmadis might have led to the attack, following the arrest of six people who are believed to be associated with the sectarian militant organization, Lashkar-e-Jhangvi (LeJ). The threat from militant groups has become so serious that it was brought up with Prime Minister Nawaz Sharif during a recent trip by CPJ to the country, according to Kati Marton, the organization’s board member and former chair. She said the committee had reminded the prime minister that if peace talks with the Taliban continued, the issue of protection of journalists must be brought up. “The issue will be taken up with the Taliban,” the prime minister told the CPJ delegation. Non-state threats are not exclusively from militant organizations such as the LEJ and TTP, but also come from separatist in Balochistan as well, according to Dietz. Since 2002, 79 journalists have been reported killed in Pakistan, a significant number of them at the hands of non-state actors, according to data provided by Pakistan Press Foundation (PPF), an independent non-governmental organization committed to promoting and defending freedom of expression. However, another threat is posed by the state, and in particular the military. “There is not a generalized fear, like there is with the Taliban, that you will be targeted if you talk about the army, but journalists in the past who have examined very closely the militant nexus with the armed forces have been targeted,” said Husain. Reporting on the military in Pakistan is considered to be a “red line” and in order to remain safe, important issues are sometimes ignored by the media, according to Rumi. While no one has been convicted for the abduction and murder of Saleem Shahzad, who had published a report on the relationship between the military and Al-Qaeda, the role of the Inter-Services Intelligence (ISI) has once again come up in the Amnesty International report. The report said that the ISI had a “tendency to send veiled threats against those who displeased them” such as journalists receiving anonymous calls and threats, or otherwise being intimidated. Historically, the military establishment has not targeted high-profile journalists, but rather more vulnerable and small-town reporters, according to Michael Kugelman, senior program associate for South and Southeast Asia at the Woodrow Wilson Center. Data collected by PPF and mapped show that most of the attacks on journalists have been outside the larger cities. The media has acted as a check on the military, still the most powerful institution in the country, and has exposed its weaknesses, “making it seem less invincible,” Kugelman said. Blaming the military and the ISI so openly would not have been possible in the late 1990s and early part of this century, when most of the news was disseminated through the state funded Pakistan Television (PTV), he added. In many ways, press freedom and journalism in the country is paradox between a “quest for freedom of expression” and threats from “elements within the state and non-state actors,” according to Rumi. “The media itself is emblematic of the democratization process in Pakistan in the sense that you’ve had a huge proliferation of private television channels over the last two years, they’re private and not controlled by the state, and they tend to be quite critical of the state,” Kugelman said. The 2008 elections saw a return of democracy in the country and 2013 marked the first time a democratically elected government passed power to another democratically elected government, a process in which the media played a critical role. “People, like Raza [Rumi], who risk their lives on an almost daily basis to cover events in Pakistan are what stand between a purely authoritarian government and an aspiring democracy,” said Marton. Another silver lining from an otherwise ugly incident could be the lessons learned from the coverage of the attack on April 19 on Hamid Mir, a news anchor who hosts the popular political talk show Capital Talk on Geo TV. Within hours of the attack on Mir, Geo TV, owned by the Jang group, flashed pictures of the Director General of ISI Lt. Gen. Zaheerul Islam accusing the ISI of the attack, without verifying the claims. Soon after, the defense ministry filed a complaint with the nation’s media regulator, the Pakistan Electronic Media Regulatory Authority (PEMRA). “The telecast in question/campaign was aimed at undermining the integrity and tarnishing the image of state institutions and its officers and falsely linking it with the terrorist outfits/activities,” read the complaint. While condemned by press freedom groups, the incident has brought the issue of sensationalist reporting to the front, and could create a standard for reporting news in a country where no code of ethics exists, said Saim Saeed, a sub-editor at The Express Tribune, an English language newspaper. “Wouldn’t it be great if something emerged from this? Let’s go slower on this [making accusation], let’s have rules and regulation,” said Dietz. “Take this period, it will be over soon, and use it as a learning lesson,” he said. A recent letter of joint solidarity, signed by more than 70 high-level journalists, called on media owners to create a code of ethics that incorporate best practices on ethical journalism, reducing the risks that journalists face, according to Owais Aslam Ali, chairman of the Pakistan Press Foundation and one of the signatories. Despite all these problems and the growing risks facing journalists in the country, Saeed is optimistic about the future of journalism in the country that is still in its infancy. Saeed added that the power of news in Pakistan, a country where politics directly affects almost every citizen, gives journalists the ability to shape the public debate. For that reason, young people are still attracted to the profession, despite the risks. To ensure that journalism and press freedom in the country develops, there is a need for “a public response, international response, and political pressure from within,” Dietz said. The sentiment amongst some journalists and analysts is that pressure from the international community, in particular, may be the most effective tool. “The prime minister understands that Pakistan’s global image has suffered because of the impunity [with which journalists are killed],” said Marton from CPJ. What may ultimately decide the future of journalism in Pakistan however, is how the attacks and threats are handled, said Joel Simon, executive director for the Committee to Protect Journalists. “The questions is, can Nawaz Sharif do anything about this [the threats]?” he said. Idrees Ali is the Washington D.C. Correspondent for Pakistan Press International. Follow him on Twitter at @idreesali114.